Featured / Recipes / 19.11.2016. Continental Croatia is abundant with chestnuts, and Kvarner region with maroon chestnuts, so autumn is an ideal time for gourmands to “dress up” the delicious chestnuts (maroons) into a thin pastry. 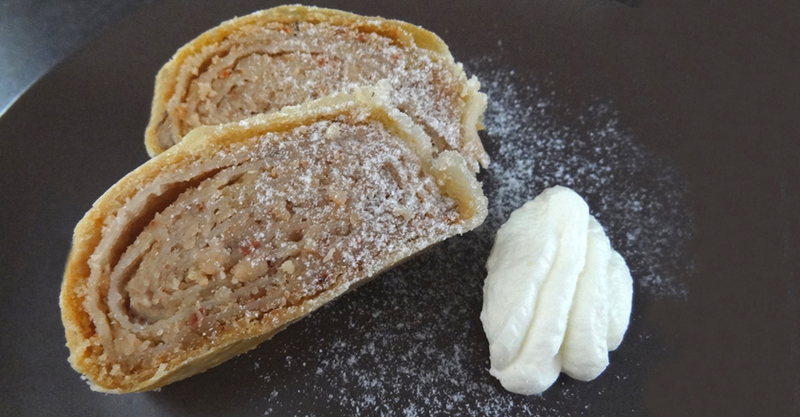 Warm or cold chestnut strudel, topped with chocolate or served next to whipped cream will be equally surprising for every palate. Sieve the flour, add salt, oil and water. Use an electric mixer to mix the ingredients for 15 minutes until you get mid-firm pastry. Form two loafs, coat them with oil on both sides, cover with plastic foil and let stand for about an hour. For the filling: mix the butter, sugar and vanilla sugar until frothy. Gradually add yolks, rum, chestnuts and in the end carefully stir in 300 ml (10.2 fl oz) of the whipping cream and firm whisked egg-white. Flour the tablecloth, put the pastry in the middle and roll it out thinly. If necessary, additionally flour the tablecloth during rolling. Coat with 3 tablespoons of oil and let stand for about 10 minutes. Continue to pull the pastry with your hands (using your upper hands slightly pull the pastry towards the edge of the table). Pour it over with 3 tablespoons of whipping cream, and then cover 2/3 of the pastry with a thin layer of half of the filling. Remove the thicker edges and then very closely cover with a part of the pastry. Then using the tablecloth roll out the pastry all the way till the end in order to get a strudel. Even out the thickness of the strudel, remove the thicker edges of the pastry. Then cut the strudel in 2 parts, distribute them in the baking pan coated with butter. Repeat the procedure with other loaf of pastry as well. Coat the strudels with part of the whipping cream and bake for 30 minutes in the oven previously heated up to 180 °C (356 °F). Then again coat with whipping cream and continue to bake for another 25 minutes. Let the strudels cool, then cut them, sprinkle with powder sugar and serve with whipping cream.